When it comes to my every day makeup, I like to keep things natural. So it's no surprise I've really been drawn toward the highlighting/strobing trend since it gives that fresh, dewey glow. 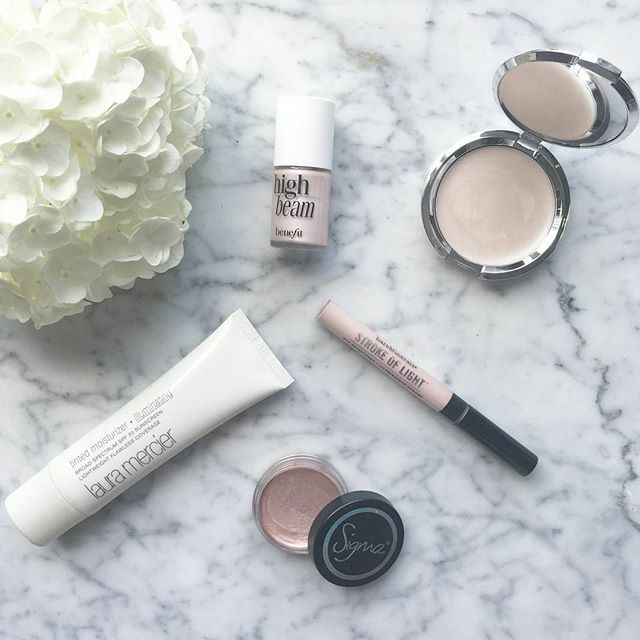 It's a great look year round and you can easily switch out products to correspond with the season, but there are a few that are constants in my makeup bag. And since I've been trying some out over the past couple months, I figured I'd share the ones I'm loving and a little bit about how I use each! 1. Laura Mercier Illuminating Tinted Moisturizer -- This is my go-to when I want an all over glow. First and foremost it's SPF 20 and seriously gives the prettiest natural shine. It's great to wear alone, but if I want more coverage I'll layer it with my favorite matte tinted moisturizer (this is especially good if you want a "lit from within" look). I'd recommend steering clear from any additional highlighters, though, at least for every day. It's pretty illuminating on its own and does a great job of allowing the light to reflect off the right parts of your face. I've tried it with other products mentioned here and ended up looking a bit too shiny -- especially in this heat. 2. Sigma Beauty Shimmer Cream -- This is super shimmery and has a semi blush-like quality to it so I tend to wear it when I want a little more color on my cheeks. It's not overwhelming, but definitely stands out so you really don't have to use a lot to get a great look. I also tend to wear this exclusively on my cheek bones as to avoid looking "red" or flushed on other parts of my face (if that makes sense haha). 3. It Costmetics Hello Light Creme Illuminizer -- This is my newest illuminator purchase and I've been wearing it non-stop. It's probably my favorite "basic" highlighter since it's not very shimmery but is the best for achieving the perfect dewey glow. I personally think it looks best with a more airbrushed look, so I'll pair it with my matte tinted moisturizer and concentrate on highlighting my cheekbones. It's also great for highlighting your brow bones, cupid's bow and other places light would naturally hit your face without being sparkly. 4. bareMinerals Stroke of Light Eye Brightener -- I've mentioned this product before and it's seriously a life saver when it comes to brightening the under eye area. It's not shimmery, but definitely has a light catching quality to help you look rested even when you're anything but. I usually layer it over my concealer and blend it downwards in a triangle shape and around my nose. And unlike some concealers, it doesn't look white! 5. Benefit High Beam Liquid Face Highlighter -- This was the first highlighter I bought and it's still a favorite. It's not quite as subtle as the one from It Costmetics, which is why I like it for when I'm going out/want a more dramatic look. If you only want to buy one highlighting product, though, this is a great option. A little goes a long way, so you can easily use it as an every day highlighter by dabbing a few dots on each cheek bone or anywhere else you want to brighten up a bit.